It’s All About YOU! by Kevin Jones. I would like to personally welcome you to enjoy my first published book. The name, Its All About YOU! was written with YOU in mind! It was designed to be read over and over again, once a year and to trigger new thoughts each year! The book is available in print or electronic form of ebook such as Kindle, Nook, etc. You can find it at Amazon, Barnes and Nobles, Kindle, Author House, etc. 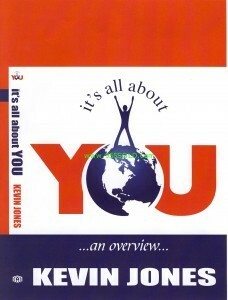 This book was written and designed to make you think, to allow you to explore “YOU” and to help ignite that inner desire that many have lost! Remember when we were kids and we Dreamed BIG? All the great things we were going to do, the many places were going to see, the extraordinary feats we were going to accomplish … what we some of your childhood dreams? How is this any different than any other book out there? First off it doesn’t say do this and do that. It is a questions based book that is designed to raise your awareness and to take action on the things that are most important to you! What if you could energize those childhood dreams and actually accomplish them today? Wouldn’t that be amazing? Well you can! The amazing thing about Human nature is the only one stopping us from having anything and everything we want in life is ourselves! Usually we have some outside influence, a feeling deep down that just gets in the way … many times blame, shame or guilt! Come with me on this Magical Journey to the Road of everything you wanted in life! Jump in the Magic Bus and take the ride of your life … there is no free lunch in life, there isn’t a magic pill and I will never say it will be easy. The key to remember, in the end it is not about getting what you want but about who you become and all the great things along the way! Please join us and take a sneak peek at Why This Book is so Powerful, Chapter One! Thank you for visiting the site and Purchasing the book, if you have questions or comments please visit our Contact Us Page. Kevin Jones is a Pismo Beach Real Estate professional at Realty Professionals! Previous post: Why This Book is So Powerful!